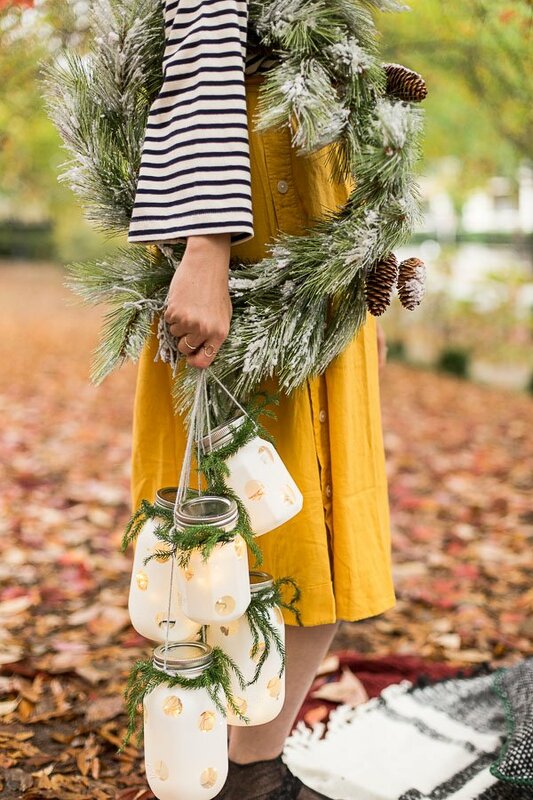 Over the years, I’ve created plenty of non-traditional holiday DIYs. And I think I always will because they’re super fun for me to create. 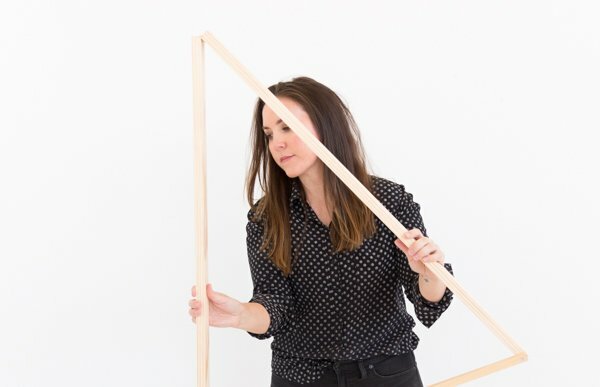 BUT sometimes there’s nothing better than adding your own DIY vibes to a classic idea (the projects that have been around for years and years). Today’s projects is one of those classics! 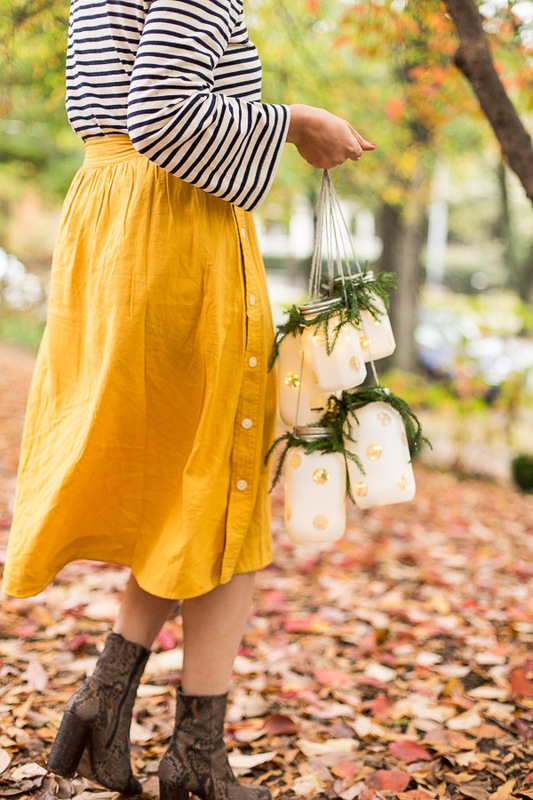 I teamed up with Ball® Home Canning to create a bunch of DIY lanterns for outdoor entertaining, using Ball® Mason Jars. To add my own twist, I made a hanging version, added polka dot patterns (because why not, right?! 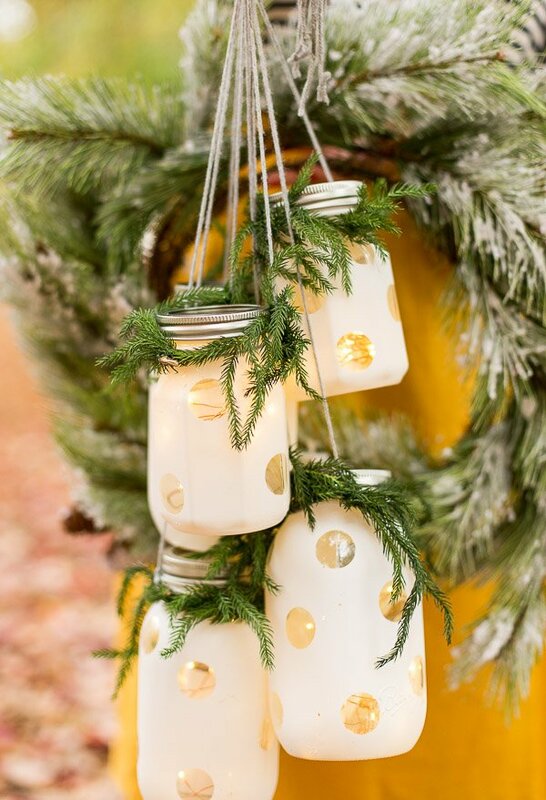 ), and spun them into DIY hanging holiday lanterns that scream Christmas from a mile away. Plus, the lights I used make the lanterns look like there are fireflies inside. Happy accident for sure! 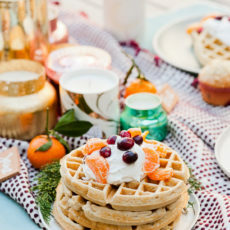 Click through for the tutorial and all the holiday-inspired photos. I got all of the jars from I used for this project the Ball® Fresh Preserving website. Which, if you’ve never checked it out before, is a great resource for anything and everything canning – from jars and lids to recipes (gotta try this sweet tea poached peaches recipe) and more. So many options and they’re all super affordable too. 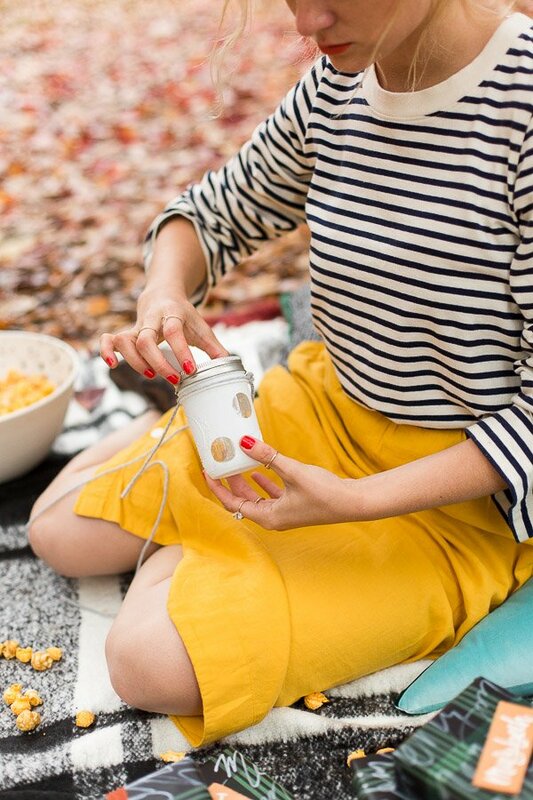 Start by adding stickers to the outside of the jars in any pattern you like. Make sure they’re smooth against the surface of the jar. Then remove the lid and spray paint in a well ventilated area. 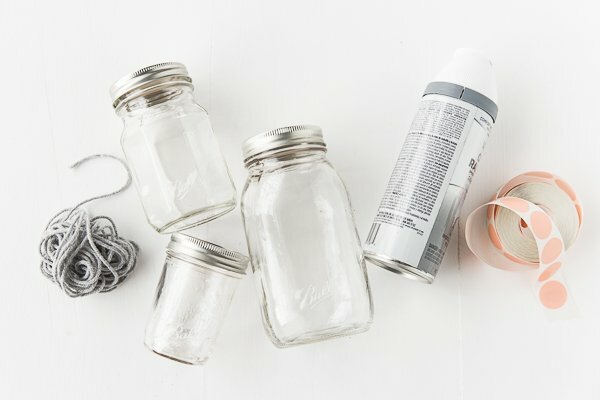 I would recommend laying out layers of newspaper outside, turning the jars upside down, and giving all the jars one to two even coats of paint. Once dry, remove the stickers from the jar. If any of the stickers are difficult to remove, use a sharp blade. Then, add a couple of long piece of yarn underneath the lid lip and triple knot them together after wrapping around the lip. 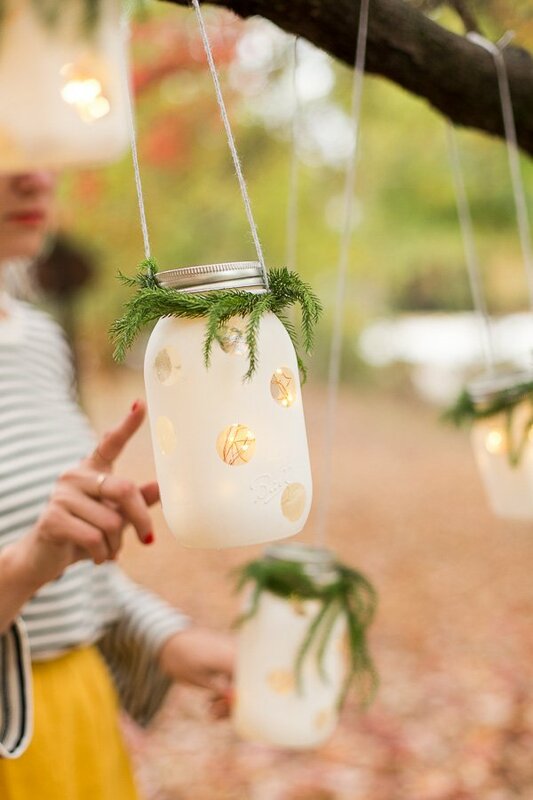 Add battery-powered LED string lights inside and close the jar. You can stop there OR play up the holidays by adding some tree trimmings around the mouth of each jar with a little bit of wire. You could even add fresh flowers for special occasions. I love how clusters of these lanterns look hanging from low tree limbs, especially as it starts to get dark outside. So pretty. Considering daylight savings is over and it’s getting darker earlier, we could all probably use a handful of these in the backyard. 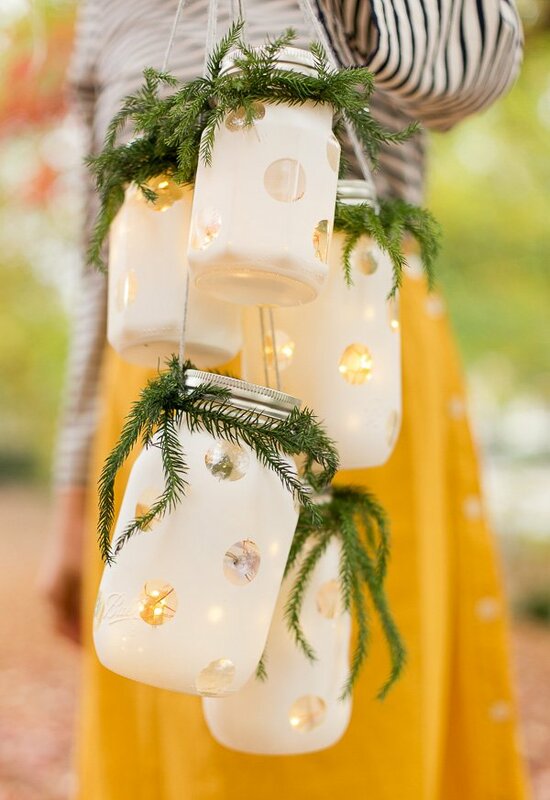 Once the holidays are over, remove the tree trimming garlands and you can reuse the polka dot lanterns all year long. What do you think? Are you ready for the holidays?! 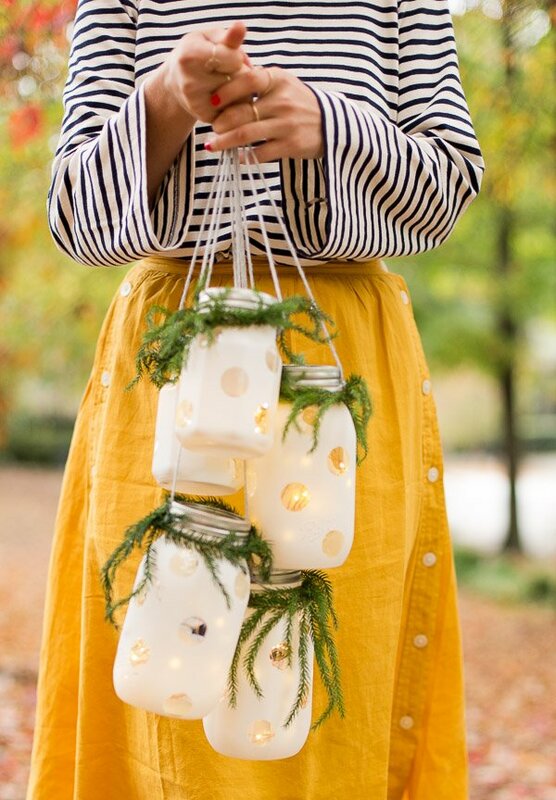 Any outdoor holiday plans where you could use these hanging lanterns? 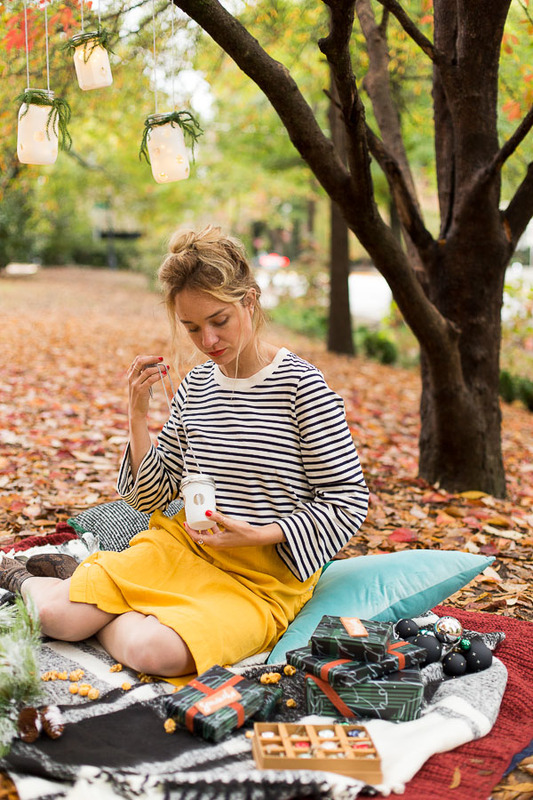 This post is in partnership with Ball® Home Canning and ShopStyle. Thank you for supporting the brands that help keep Paper & Stitch running. 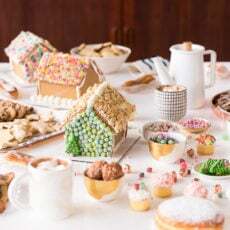 DIY Holiday Entertaining: My Tiny Party Reveal for the Holidays + $500 Giveaway! 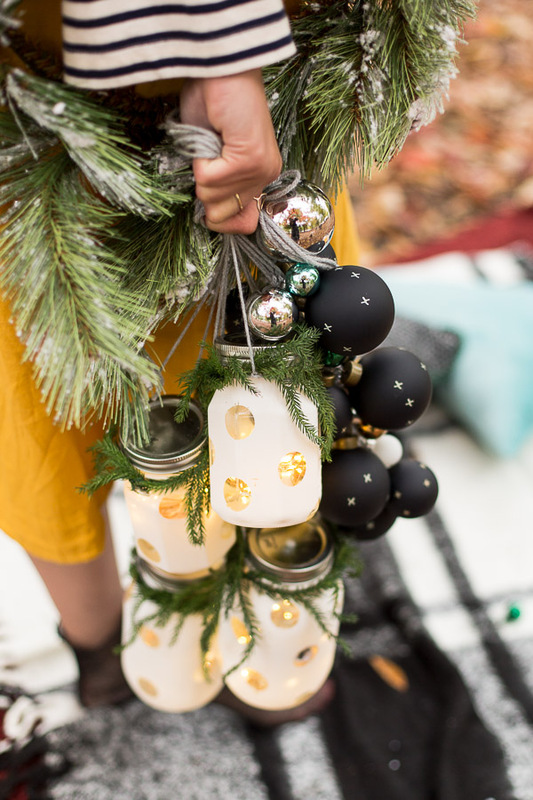 next post >DIY Holiday Entertaining: My Tiny Party Reveal for the Holidays + $500 Giveaway! Those lanterns are so cute!! I love the polka dots. Thanks Courtney. 🙂 Loving polka dots at the moment too. They look wonderful, and I really like that they aren’t ‘traditional’ Christmas decoration! Thanks Michelle. 🙂 They were fun to make! So easy too. Darling idea! So you don’t have to reach into the jars to turn lights on/off, get remote controlled lights from Pier One. They are awesome. These are absolutely beautiful! I love them with the black and silver ornaments, Stunning! With these being glass and around here the temp get pretty cold at times or with the bad weather. I love the idea it’s really cute. That is so cute… I love it. I wish you very warm and happy holiday. These jars are great. I think I will use stars.